You’ve probably heard or read that compost is really useful in the vegetable garden, not to say essential. But if you’re not sure when you should use it, and when you should use something else, then read this quick guide, and you’ll be much more confident. Compost is an ideal way to add organic matter to soil - It doesn’t matter whether it’s home-made or whether you buy it from compost suppliers, as the organic content will be broadly similar. The only question is whether you can make enough for everything you need. The first is that compost improves soil structure. It doesn’t matter whether your soil is sandy or heavy clay, adding organic matter makes it closer to the ideal loam. It adds smaller particles to sand, improving the water retaining properties, and it breaks up a clay soil. The second reason is that it adds nutrients. With the best will in the world, and even with a really good crop rotation system, vegetable growing is hungry on the soil. Unless you want to use vast quantities of fertiliser, and most of us don’t, then you’ll need to find a way to put some of the nutrients back again. Compost or manure is the ideal way to do this. Mushroom compost and mushroom and manure compost are really good sources of organic matter for vegetable gardening, find out more about mushroom composts. But if you do buy compost, make sure that these are from a reputable supplier, and that they treat their compost to remove any spores, unless you really want to start a mushroom farm. In autumn, wait until you’ve removed most of the summer crops, leaving only brassicas and any overwintering root vegetables. Spread your compost over the whole area, including around any plants that are left. You don’t even have to dig it in if you don’t want to, as it will gently rot in over winter. In spring, again spread it over the whole area. 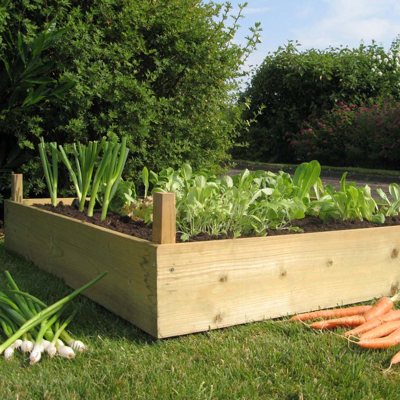 If you’re using manure, particularly if you’re not sure how well-rotted it is, don’t add it to any beds where you’re going to grow root vegetables. Carrots and parsnips won’t grow directly towards manure, so they twist and turn if they meet a bit in the soil. Bizarre, but true. It’s also really good to add compost when you’re planning to grow particularly hungry vegetables, or ones that need a lot of moisture, such as cauliflowers or celeriac. For these plants, dig a trench about a spade or two’s depth, and fill it with compost or manure before planting.